An asylum seeker says he clung to a rubber tube and drifted helplessly for three days before rescue as the sole survivor of a boat that sank en route to Christmas Island. Habib Ullah, 22, of Karachi, said he was among 34 Hazara from Afghanistan and Pakistan aboard a rickety boat that left Indonesia on October 26. Speaking from Jakarta’s Kuningan Detention Centre, an emotional Mr Ullah said the engine failed and the boat started taking on water in treacherous conditions after about one-third of the voyage. He described the horror of watching friends, many who could not swim, drown around him as he clung to the tube he took aboard with him. He said he was in despair as his hopes of rescue faded fast. “I saw very big oil tankers but they were too far from me,” he said. “I was at the mercy of the ocean and very scared. He was semiconscious when fishermen picked him up and nursed him for five days before handing him to Indonesian officials. Mr Ullah told his story to send a message to Prime Minister Julia Gillard and Opposition Leader Tony Abbott. But he did not see offshore processing as the solution. Mr Ullah said Hazaras in Pakistan and Afghanistan gambled with their lives just walking to the markets. “I want to complete my education in a safe environment where there is no prejudice or religious violence,” he said. Refugee advocate Victoria Martin-Iverson said it was the second boat lost in the past four months with neither reported in the media. 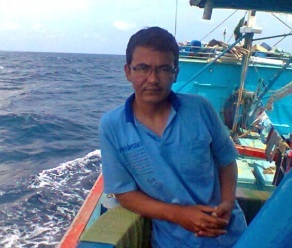 Shahin Tanin, of Brisbane, has grave fears for his cousin Mohammad Jawad, 40, who left Jakarta on August 13. Mr Tanin said none of the 26 Hazara passengers, including women and children, has been heard from. “I fear he has drowned or why wouldn’t one of them contact us,” he said. He said Mr Jawad was forced to flee Afghanistan after the Taliban threatened to kill him when he refused to join them. Ms Martin-Iverson said she wondered how many lives were lost at sea without the public knowing. In June, it was reported a boat with 67 asylum seekers disappeared en route to Christmas Island.